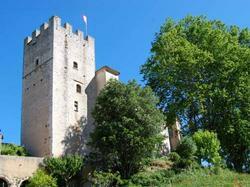 This converted castle with a 30-metre tower has panoramic views of Lake Esparron in the heart of Verdon Regional Park. It offers B&B accommodation and a self-catering apartment with free Wi-Fi access. All the guest rooms and the apartment have open fireplaces and are individually decorated in an elegant style. Each room has views of the surrounding countryside and an electric kettle for making hot drinks. A breakfast including homemade products is offered every morning in the former kitchen of the castle. Restaurants for lunch and dinner are within walking distance of the chateau. Guests can swim or rent small boats on Lake Esparron. Verdon Gorge is 40 minutes by car. Free private parking is provided. If you expect to arrive after 20:00, please contact the property in advance. Contact details can be found on the booking confirmation. Please note that the rooms are set on the 4th and 5th floor and in the property's towers. They are only accessible by stairs. This self-catered apartment is set in the medieval part of the house. It has an adjoining room in the 13th-century tower, which offers a piano and a seating area. This apartment can accommodate an extra bed at no extra charge. Please note that a EUR 30 end-of-stay cleaning fee per hour is not included in the price as well as a EUR 10 linen cleaning fee per person. The Prestige room is situated high in the 2nd floor of the 18th century wing overlooking the countryside and two hundred year old plane trees. Free WiFi access and an electric kettle are provided in this en suite room with fireplace and sofa. Free WiFi access and an electric kettle are provided in this en suite room with a marble fireplace and sofa located in the 18-th centurey wing of the residence. Offering views of the countryside, this flat takes up the entire 4th floor of the 18th-century wing. Rooms have high ceilings and are decorated with marble mantlepieces, original furniture and characteristic provençal 'tommette' tiled floors. The tile floors and thick walls help to keep the rooms cool at night during summer. A shaded rose garden with garden furniture, barbecue facilities and a Ping-Pong table are at your disposal. This flat can sleep up to 8 people (4 more) if you add a Comfort room to it. Please note that a EUR 30 end-of-stay cleaning fee per hour is not included in the price as well as a EUR 10 linen cleaning fee per person. Free WiFi access and an electric kettle are provided in this en suite room with fireplace. Offering views of the countryside, this flat takes up the entire 3rd floor of the 18th-century wing. Rooms have high ceilings and are decorated with marble mantlepieces, original furniture and characteristic provençal 'tommette' tiled floors. The tiled floors and thick walls help to keep the rooms cool at night during summer. A shaded rose garden with garden furniture, barbecue facilities and a Ping-Pong table are at your disposal. This flat can sleep up to 6 people (2 more) if you add a Comfort room to it. Please note that a EUR 30 end-of-stay cleaning fee per hour is not included in the price as well as a EUR 10 linen cleaning fee per person.